Umlaut Audio is delighted to announce MOTORS, the fourth in its virtual instrument range following PADS, ARPS, and uBEAT which has been acclaimed by film and game composers worldwide. 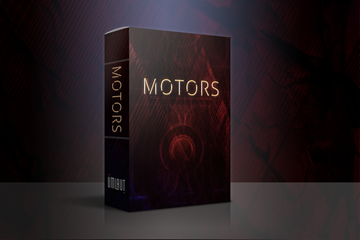 MOTORS is a dual-layered virtual instrument exclusively crafted to create tonal and rhythmic pulses and provides further exciting creative options using rhythmic variations with organic and minimal source loops. Designed for Native Instruments’ KONTAKT software, it offers over one hundred forty presets plus a variety of features enabling the creation of rhythmic motifs with an almost limitless range of variations and powerful combinations. These are made possible by unique features such as the Loop Legato mode that can switch between variations on the fly with the help of Key Switches and Layer Offset Controls which provide in-depth possibilities with individual layer controls. “Impressive! This is an instrument that is clearly designed to help you craft creative sounding breaks and backgrounds in record time. MOTORS hits the perfect mix of ‘out of the box’ playability and ‘deep down the rabbit hole’ tweaking options”, said Matt Vanacoro from AskAudio. “Film, media, and gaming composers everywhere are going to absolutely love this instrument”. Featuring minimal, organic and pulsating sounds, the dual-layered pulse engine offers simultaneous playback of two sound layers, each with its own set of editing options and a global crossfade. There’s also a dedicated page for assigning and tweaking modulation parameters for various controls within the instrument. Each Layer has its own set of seven insert effects, and an additional Global Effects Section, along with Sends and Insert FX to add a new dimension. An extensive array of modulation options via Envelopes, LFOs, and Step Sequencers complete the package, easily transforming the source sounds to add intensity and excitement to your composition. Inspired by the intuitive workflow of Umlaut’s highly successful PADS instrument, MOTORS pushes the boundaries one step further by allowing a similar workflow to be applied to loop sounds. For those who already own PADS, the new instrument will feel comfortably familiar with many features and options being shared between the two. MOTORS has been designed to be incredibly intuitive and minimal, allowing users to go straight for the sounds they’re looking for and create thrilling pulses for any scores. A dual-layered virtual instrument exclusively crafted to create tonal and rhythmic pulses.